Cover Image: He is Not Here by Walter Rane. When I was growing up, the week before Easter was a major focus of worship for my Episcopalian teacher and friend, Vera. She and her family called it “Holy Week.” I’m missing her today; she died several years ago. I’m also missing hearing her tell about her Easter preparations. Something deep inside me is longing to be more aware, worshipful, and focused on the wonder and meaning of Christ’s Atonement, death, and resurrection. “What might have been, even for the ‘righteous’ If there had been no atoning sacrifice, stirs the very depths of human emotion. “First, there would be no resurrection, or as suggested in the explicit language of Jacob: ‘This flesh must have laid down to rot and to crumble to its mother earth, to rise no more’ (2 Nephi 9:7). “Secondly, our spirit would become subject to the devil. He would have ‘all power over you’ and ‘seal you his’ (Alma 34:35). In fact we would become like him, even ‘angels to a devil’ (2 Nephi 9:9). “Third, we would be ‘shut out from the presence of our God’ (2 Nephi 9:9), to remain forever with the father of lies. “Fourth, we would be without hope, for ‘if Christ be not risen, then is our preaching vain, and your faith is also vain. . . . If in this life only we have hope in Christ, we are of all men most miserable’ (1 Corinthians 15:14). Is there any way we can comprehend the importance of what Jesus did for us? Is there any way we can sufficiently express our gratitude? On “Palm Sunday,” the Sunday before Easter, many Christians celebrate the triumphal entry of Jesus into the city, the day when the multitude waved palm branches and shouted Hosannas. I want to wave palm branches and shout Hosannas too! I want to focus my thoughts and study on the Risen Lord. Because of my positive experiences with Vera, I was motivated to go online and research Christian traditions for the preparatory celebrating of Easter. 1) Holy Week begins with Palm Sunday and continues through Holy Thursday—when the Sacrament was instituted at the Last Supper—and Good Friday, when Jesus was tried, crucified, and buried. 2) Scripture reading: When facing temptation in the desert, Jesus relied on scripture to counter the wiles of the devil. It is a formidable weapon for us as well. 3) Lent (the 40-day period before Easter Sunday) is to be a season that includes fasting (which is usually defined as having only one meal a day), self-denial, spiritual growth, conversion, and simplicity. Many traditions associated with Lent have a long history, such as fasting, almsgiving (which they define as service of any kind), reading the scriptures, and prayer. (Again, all practices which are not only appropriate, but also essential to all of us. Author Dennis Bratcher had some interesting thoughts on Lent and Easter. He said that Lent is a way to place ourselves before God in a humbled state, a way to empty ourselves of false pride and rationalizations that blind us to the beam in our own eyes. Stanley E. Winchester, in his manuscript His Grace is Sufficient, said, “I think the difference between Jesus’ pre-Atonement knowledge and post-Atonement knowledge was physical and emotional experience. He already knew everything intellectually, but He had not physically or emotionally experienced our sins, sorrows, and pains until Gethsemane and Golgotha. Even though Jesus knew exactly what was coming in Gethsemane He prayed that He might not have to actually experience it, but as always He submitted to the Father’s will. So, even though Jesus is all-knowing, He still had to experience all in order to ‘[finish His] preparations unto the children of men’ (D&C 19:19)! No amount of intellectual knowledge comes close to the impact of actual experience; it is so important that the Lord said to Joseph Smith, “if the very jaws of hell shall gape open the mouth wide after thee, know thou, my son, that all these things shall give thee experience, and shall be for thy good” (D&C 122:7). To know that the Lord Jesus Christ has experienced it all can give us the most solid trust in Him. The scriptures are emphatic on this point – “He comprehended all things” because “He descended below all things” (D&C 88:6; 122:8). Mike commented about “the powerful contradictions” the Savior suffered. He said, “After thinking and wondering about what these “contradictions” could be for a long time, even years, the answers came while I was driving home one evening, pondering the question yet again. Suddenly, ideas came to my mind, one at a time, clearly, like bullet points – completely formed. As each one came, it seemingly overwhelmed my mind, like waves in the surf…I would just reach the surface, only to have another wave of thought overpower me. The Only Perfect One – suffered the consequences of all error, miscalculation, failure, omissions, misunderstanding, bad choices, inadequacy, improper judgment, humiliation, and rejection. The Lord is so compassionate that He even rewards our desire to have more faith. Remember when the father of the stricken son “cried out, and said with tears, Lord, I believe; help thou mine unbelief.” This limited faith was rewarded with the miraculous healing of his son. (Mark 9:17, 24; see also verses 17-29.) Alma confirms this when he said, “But behold, if ye will awake and arouse your faculties, even to an experiment upon my words, and exercise a particle of faith, yea, even if ye can no more than desire to believe, let this desire work in you, even until ye believe in a manner that ye can give place for a portion of my words.” (Alma 32:27; see also verses 27-43.) Our Savior wants to bless us; He wants to heal us, and because of His Atonement He knows when our faith is sufficient. I’m so grateful to know that the Savior understands, truly understands. I’m so grateful for all He has done for us. I know that Jesus, the Son of God, was sent not only to wash away our sins but to also bear our grief and wipe away our tears. When I walked through the valley of the shadow of death and grieved with deep sorrow when loved ones have died, I felt the great solace of the Comforter. I give thanks for the assurance of a glorious resurrection and reunion. 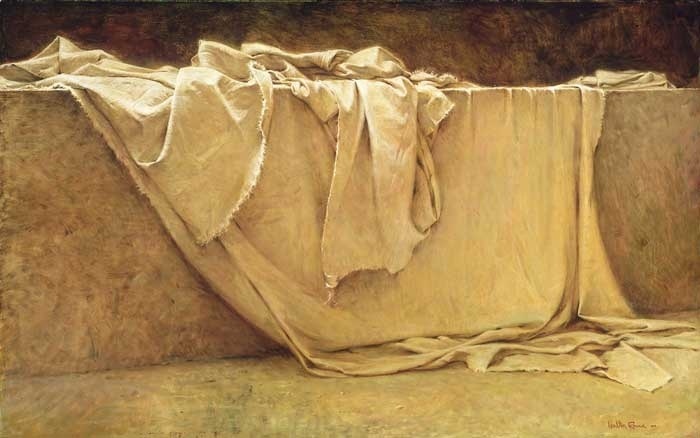 I know that my Redeemer lives and that His resurrection broke the bands of death for all of us. His resurrection assures each one of us a glorious resurrection. That is the message of Easter! When I feel the pain of recognition of my sins, I can yet rejoice and give thanks for the knowledge that as I repent the Savior not only forgives my sins; He also heals my heart. I know, because, line upon line, precept upon precept, here a little and there a little, He is doing that for me—in spite of my glaring inconsistencies, in spite of my faults and failings and personal weaknesses. And that is the message of Easter! These are saving truths; these are precious gems confirmed to my soul by the Holy Ghost and offered to you with a humble prayer that they may be confirmed in yours. This was beautifully written and received by my heart. Thank you for researching it, writing it and sharing it with us. Heat insights. Great article. Thank you Darla. I am grateful for the insights given in this article. Even in my inability to comprehend the Savior's sacrifice, He does "not only forgive my sins; He also heals my heart." This will definitely deepen my worship during this Easter season!